With clean lines and smooth surfaces, the Modern Fire Table easily serves as a focal point to your outdoor living space. This table features a deep black finish, that has been powder coated to resist rust and hold up for your enjoyment outdoors. The hollow base gives you a convenient resting spot for your feet and makes the table super lightweight and maneuverable. Just when you didnt think it was possible, wine night with the girls just got a whole lot better! Enhance your outdoor living area with the breathtaking Propane Fire Pit Chat Table. Minimal assembly is required, which means you can enjoy your new unit just minutes after unboxing it! This fire table comes complete with a beautiful granite tabletop, lava rocks, and a stainless steel burner, guaranteed to give you years of enjoyment. Create an inviting atmosphere as you entertain guests outdoors, or throw a s'mores party with the kids. Whatever your plans are, this unit is sure to bring the family closer together outdoors! Added for your safety, the Propane Fire Pit Chat Table comes with a thermocouple flame failure device and built-in control panel for seamless lighting and extinguishing. Give your outdoor dicor a makeover with the Eden 38 inch Gas Fire Pit Table from Pleasant Hearth. 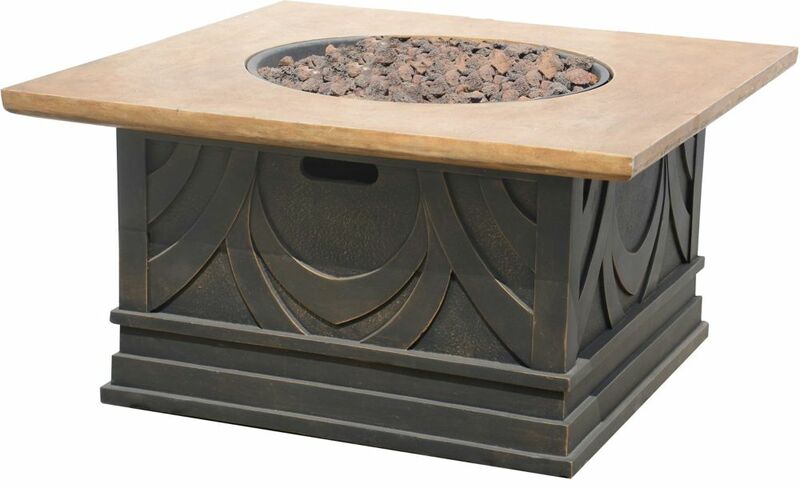 This decorative fire pit is constructed of heavy-duty steel that features a perforated design on the sides. The rubbed bronze finish will match with various colours and styles of outdoor furniture, making it the perfect addition to your deck or patio. The impressive 40,000 BTU's of heat output will keep your guests warm and cozy on the chilliest of nights, while the included amber coloured glass rocks add a warm flame effect. When the fire pit is not in use, convert it into an occasional table with the included table lid. Let the good times roll with family and friends around the Eden gas fire pit table. Avila Gas Fire Table is rated 3.7 out of 5 by 14. Rated 1 out of 5 by Mike from Propane Tank is outside of product which looks bad. Did not realize this when bought the product.... Propane Tank is outside of product which looks bad. Did not realize this when bought the product. Too expensive. Rated 1 out of 5 by Joneser from Wrong dimensions Nice product but the dimensions are way off. The table is 34.5." square not 40". That's a huge difference- enough for this to go back to Home Depot. Drinks get hot if they sit on the table top because it's too small and too close to the flames. Rated 5 out of 5 by llamamom from really nice, even better in person! Went together easily and looks really nice! We did get black glass to replace the lava...will need 2 bags. Rated 1 out of 5 by dissapointed from Disapointing Product My fire pit was delivered to my house when I opened the box that was packaged pretty well but the marble looking top was broken all the way around, I was wondering if I could get it back in the box without it falling apart. I can see why they don't display them in the stores they wouldn't sell any. They did take it back at the store no questions asked!!! Rated 4 out of 5 by Theresa from Beautiful Design Bought this as a Christmas Gift for our son-in-law. Decided on a propane gas fire pit due to a covered patio. Wish Home Depot would carry more fire pits in store. This was only available on their website. Only wish this was convertible to a wood burning as well. A little smaller than expected for the price, however, home depot offered this at a less expensive price than the same fire pit on other web sites. Beautiful design, coffee table height just right! Shipping a bit expensive at $55.00. Had the option to have it shipped to the store for pick up for less shipping, however, too heavy for me to transport. Rated 4 out of 5 by Becca from nice fire table nice size, already assembled. Heats area close to fire. Rated 5 out of 5 by TeddyToo from beautiful and functional Super easy to assemble. The top is darker than the photo shows but will show less dust.